We're delighted that you appreciate an artfully-addressed envelope, the way it stands out in any context and conveys a special sense of care. 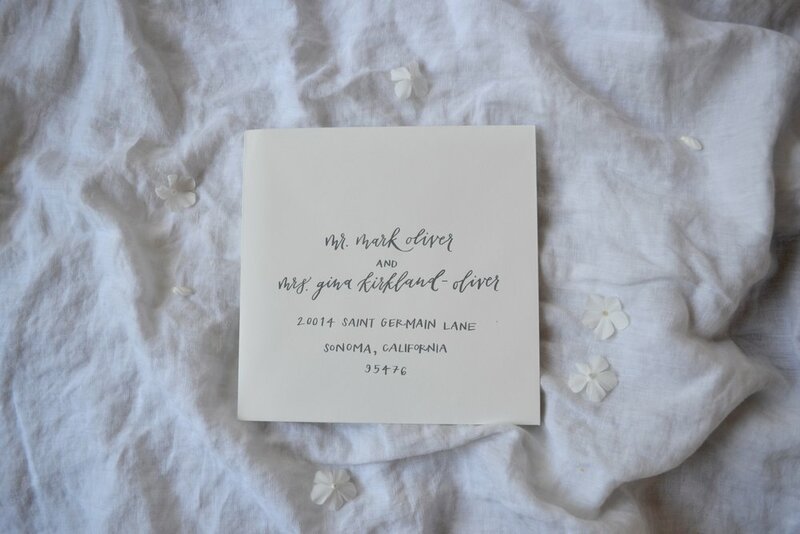 Clay & Ink envelopes accentuate the beauty of your wedding and party invitations, professional correspondence, and thank you notes—handwritten work always inspires an undeniable response. 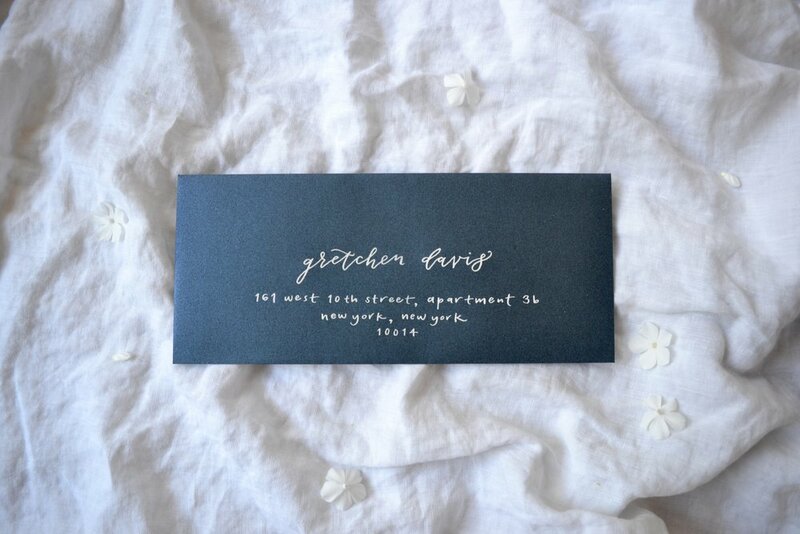 Please note that this order page is for handwritten, mailing address calligraphy on envelopes. If you are looking for invitation design/printing or any other custom order, please visit the custom design page and submit an inquiry. and Alaïa will commence calligraphing your order! You'll receive the finished envelopes shipped to your destination along with a final invoice to be paid after delivery. 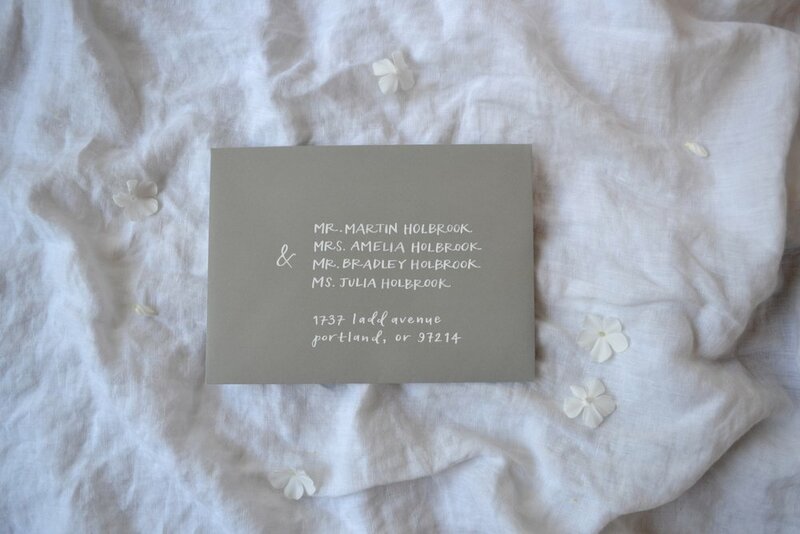 Wording in samples A-H can be customized to match your addressing etiquette preferences, eg. adding "Mr. & Mrs." or full names. Base price for these styles is $2.00 per envelope. If you would like a specific style beyond A-H that appears in the custom portfolio or a completely original design, please elaborate in the following 'layout modifications' field. Additional alterations to samples A-H will be happily accommodated. Please describe any changes you'd prefer, such as centered or left-justified layout, ZIP code on separate line, apartment number on separate line, etc. Each modification adds $0.25 per envelope. Standard house inks (featured in the samples) are white, black, navy, walnut brown, and gold. Nearly any other ink color can be prepared at no additional charge, but please be as specific as possible! A PMS code would be great, or feel free to send a sample of your invitations for color-matching. If you would like Clay & Ink to procure envelopes, please specify size, paper color, and texture; prices start at $0.75 per envelope. If you, the client, will be providing envelopes, please specify what type and send an extra 15% of your desired quantity as overage. Textured/handmade paper may require additional samples for ink testing. You may select any options that interest you and we'll correspond further about details. Express here any wishes not yet specified: Would you like a custom monogram or crest? Watercolor ink? Silk ribbon? Or maybe you're just really excited to get started--we'd love to hear your thoughts!